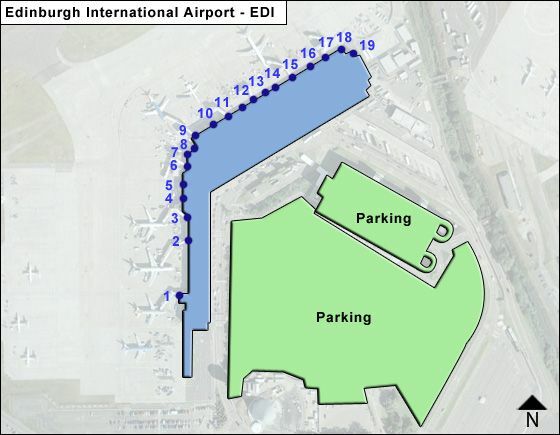 At present, EDI has one passenger terminal with ground & first levels. Considerable space has been added during the East Extension Project* - which came to a close upon the opening of the new Plaza Center piece - the 'front door' to the terminal - linking the East extension directly to the tram stop, while offering easy access to the drop-off zone & bus stops. Ongoing Airside transformation work until 2019 - aimed at larger aircraft - will triple its capacity. The ground level is for (a) arrivals of domestic & international passengers, and (b) for passenger check-in: The center entrance leads to check-in desks 1 to 48. The left entrance leads to International Arrivals with cash machine, Information desk, prayer room, Costa Coffee, 2 stores and access to International baggage reclaims C1, C2, & C3. The right entrance leads to UK arrivals, Costa Coffee, and baggage reclaims C4, C5 & C6. This level also has American Express, customs point, 'Lastminute.com', Lost & Found, reserved seating, & Shop & Collect. The first level is the boarding level - divided into gates 1 - 9 to the left, and gates 10 - 23 to the right. Food & drink, American Express, and Customs are available. This side also houses the Airline lounges. Using the 'Travelator' connection from the terminal, you get to gate area 13 to 23, with WHSmith & Cafe, reserved seating, a cash machine and the Flybe lounge. - 'No. 1 Edinburgh Lounge' is next to Liquorice Tree & entrance to domestic arrivals. - Aspire Lounge located in the separture lounge (after security check, turn left, follow signs for gates 1-5. * The East Extension of the terminal involved a new 6,000 sq.meter facility - built around a larger security area - enabling passengers to move faster & more efficiently through that part of the terminal. A new glass facade & media screen now welcomes arriving passengers. The East Extension houses a state-of-the-art security hall, shops & staff offices. Its large 'M&S Simply Food' premium store offers quality & innovative products - accessible to arriving & departing passengers. A new soft-play area for children is now in the departure lounge. World Duty Free has doubled in size. The new retail area offers the Prime Pharmacy, along with jewellery units. The remaining work involves a surrounding structure - to be built 'in next 5 years'). - The Virtual Assistant communicates important security messages to passengers in English, Polish, Spanish & Italian. It uses visual props and audio messages and is available 24/7. - 20 SONIC common self-service kiosks (usable for all airlines) enable passengers to weigh baggage, print out tag and dispatch bags themselves. The new baggage drop can process over 1,200 bags per hour. - Connecting to your next flight: Do allow yourself plenty of transfer time between connecting flights, particularly if your luggage has not been checked through to your final destination. (a) If connecting from an internatonal flight to a UK flight, you must pass through passport control / immigration. (b) If connecting from a UK flight to an international flight, you must pass through special immigration control points, which may ask you to present your passport. (c) If stopping over between connecting flights, you need to leave the airport by first going through passport control, baggage reclaim & Customs. Upon your return to the Airport you need to check in as usual. Keep in mind that there is no sleepover at the Airport, and you will have to contact your hotel of choice.